A representative of the Grenada Postal Corporation has confirmed that since the commemorative Sir Eric Matthew Gairy stamps have been put on sale, they have been embraced by the general public to the extent that those in the 40¢ denomination are almost sold out. Arlington Martin of the GPC Marketing Department said that the stamps are available at all branches of the Postal Corporation and are in five denominations. “They can be used for regular postage, locally, regionally and internationally, or persons can choose to buy them as collectors’ items,” he explained. “We have them in EC 40¢, 75¢, $1, $1.25 and $10. Since they went on sale on 10 February, the 40¢ ones are the most purchased, especially for domestic mailing,” he said. Martin said that there are buyers who are specifically requesting the Sir Eric stamps while others have to be told about the stamps. In his 2014 Independence address, Prime Minister Dr Keith Mitchell announced that the stamps were to be unveiled as part of initiatives aimed at remembering Sir Eric, who was the island’s first Prime Minister when the country gained Independence in 1974. 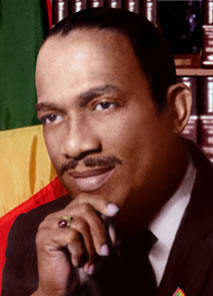 Martin said that besides the Sir Eric stamps, there are also stamps dedicated to Anthony George – the designer of the Grenada Flag. “It was launched in 2012, but they are not selling as quickly as the Sir Eric stamps. People can therefore ask for them when using the services of the post,” he advised. When he won the 2012 gold medal, the then Tillman Thomas administration announced that a stamp will be unveiled depicting Kirani James, but that initiatives ran into some legal challenges. It is expected that the issue will be resolved and a stamp will be available in the future be dedicated to James.